I’m not a big sports fan, but I love a good sports movie. They’re full of feel-good moments, stories of teamwork, and underdog stories. And, these characteristics are exactly why they’re perfect for a family movie night. 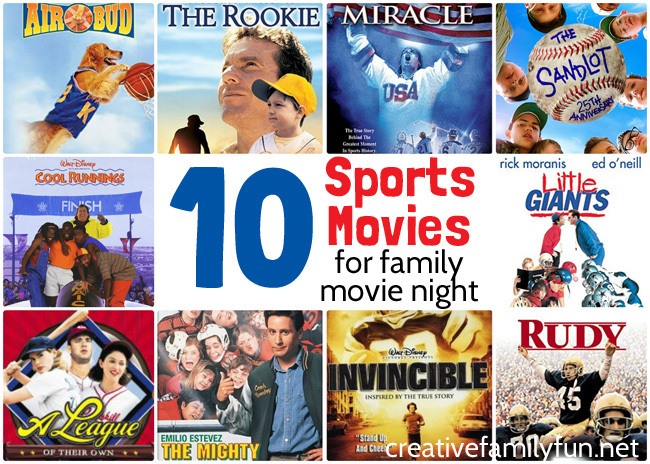 So, grab the family and get ready to cheer with our Top 10 Sports Movies for Families! You’ll have a fun night! 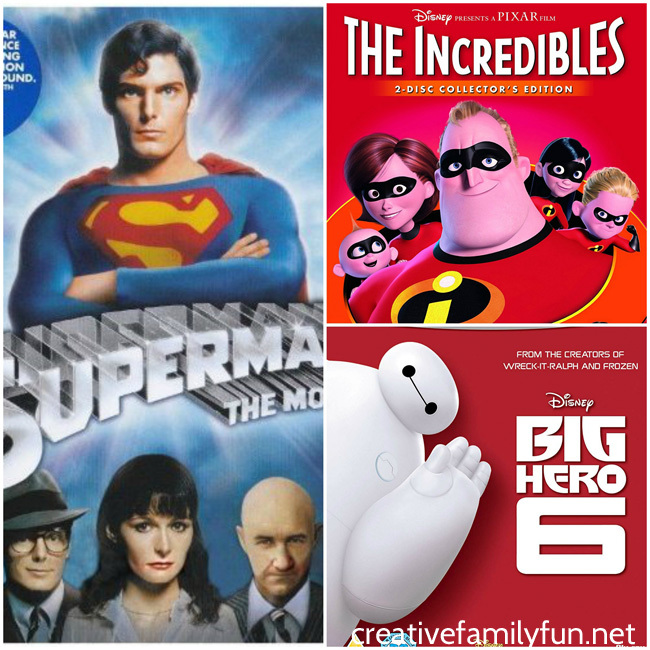 And, when you’re ready to plan another movie night, check out all of our recommended family friendly movies here. Note: I pulled the age suggestions from Common Sense Media. These suggestions are just that – a suggestion. You know your kids better than anyone and can best make the decision as to what movies are best for your family. 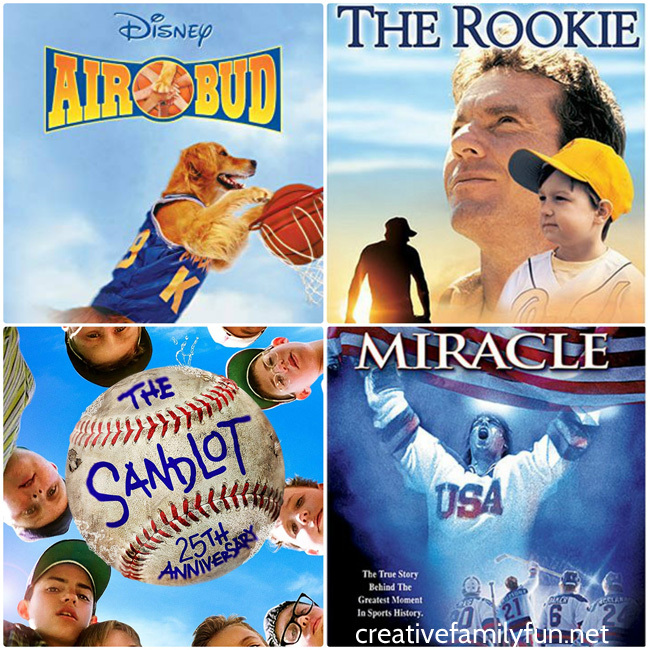 Air Bud (ages 6+, rated PG) Usually, I try to find movies that appeal to both kids and parents, but I’ll confess that this choice is much more appealing to kids. But, it’s a cute movie for kids who love dogs – and sports. 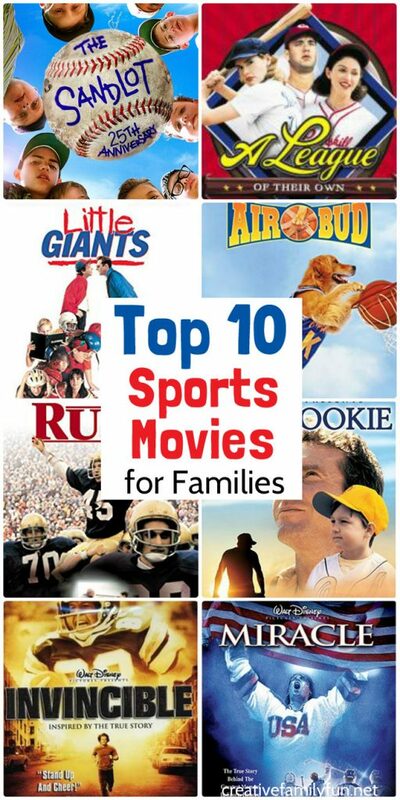 Plus, it’s the sports movie that best appeals to the younger kids. The Rookie (ages 7+, rated G) The Rookie is the story of a high school baseball coach who promises his team that if they’ll win the division title, he’ll try out for the major leagues. This movie is great for families, but may not be as appealing to younger kids because the movie revolves around an adult and not kids. Cool Runnings (ages 8+, rated PG) Cool Runnings is a funny and positive movie inspired by the Jamaican bobsled team’s appearance at the 1988 Winter Olympic Games. It’s a fun choice if you love underdog stories. Miracle (ages 8+, rated PG) If you’ve got hockey fans, this movie about the United States hockey teams’ unlikely gold medal victory in the 1980 Winter Olympic Games. And even if you’re not hockey fans, you’ll enjoy this movie and will be cheering along the whole time. The Sandlot (ages 8+, rated PG) This story about shenanigans of a pick-up neighborhood baseball team in the 1950’s. This movie is full of nostalgia and is a family favorite at our house. This movie does include swearing, including by some of the kids, so if that bothers you, you may want to pre-screen it. A League of Their Own (ages 10+, rated PG) A League of Their Own is a classic sports movie based on the All-American Girls Professional Girls Baseball League from the 1940’s. It’s full of positive female role models with a good message about teamwork. Invincible (ages 10+, rated PG) I love this underdog movie about a 30-year-old down on his luck man who goes to open try-outs for the Philadelphia Eagles and makes the team. It’s a great movie that shows the power of dreams and that it’s never to late to chase them. Little Giants (ages 10+, rated PG) What happens when you don’t make a peewee football team because you’re a girl? Well, hopefully your dad volunteers to coach your own rag-tag football team. This movie is full of potty-humor and has some swearing, but overall it’s a fun and positive choice. Mighty Ducks (ages 11+, rated PG) The Mighty Ducks is the story of a ragtag hockey team and their coach, who doesn’t even want to be coaching but has to because of a community service violation. This is a fun and positive movie about teamwork and the joy of sports. But, like a few other choices here, there is some swearing which makes it more suitable for older kids than for younger ones. Rudy (ages 11+, rated PG) I will confess that Rudy is one of my all-time favorite movies (and I’m not even a football fan). It’s based on the true-story of an underdog who overcomes great odds to play football for Notre Dame. You cheer, you’ll cry, and you’ll have a great time watching this with your family. 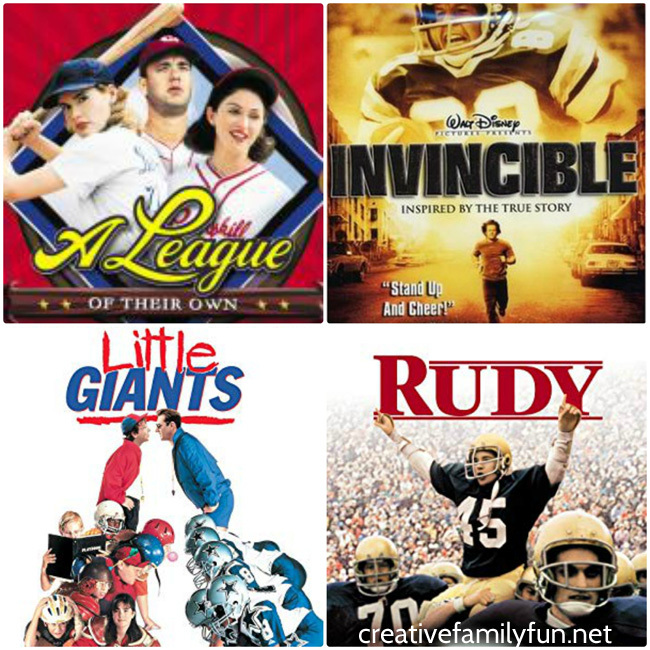 Which one of these sports movies for families are you going to watch for your next family movie night? Do you have a favorite that didn’t make the list? My husband and two girls all love superheroes. They love the movies, the toys, and books. And, they’ve been trying to draw me into their world. So, when we have a family movie night, superhero movies are very popular. 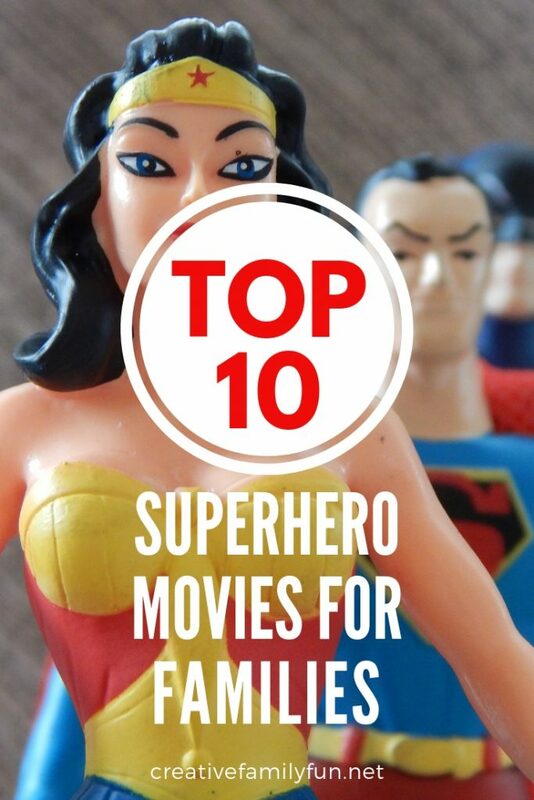 Since we’ve seen so many, I asked my superhero expert (my husband) to come up with his list of Top 10 Superhero Movies for Families. 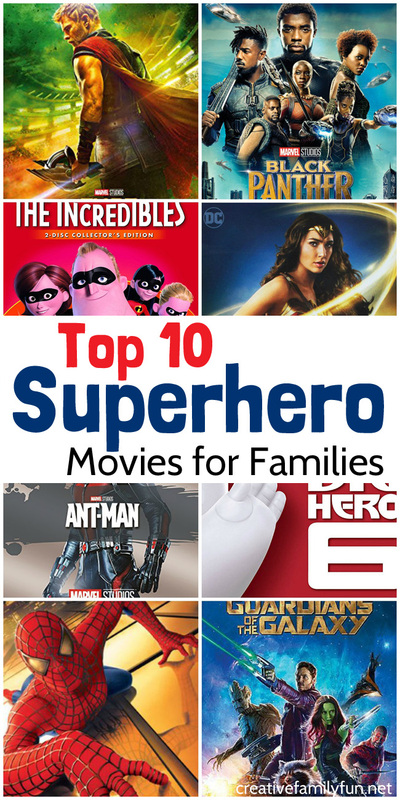 And after superhero movie night, try one of these great ideas for family friendly movies to watch on your next movie night. Get ready for an exciting movie night! These movies are so much fun! Note: I pulled the age suggestions from Common Sense Media. These suggestions are just that – a suggestion. 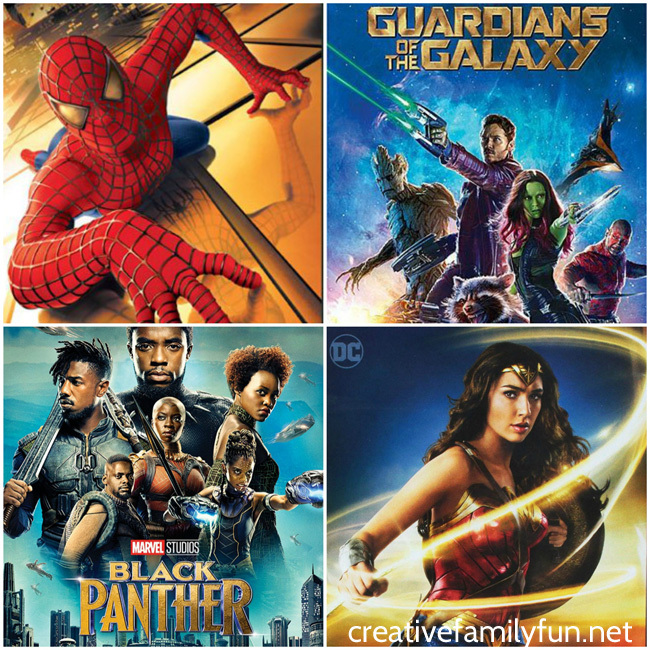 Our family has allowed our kids of a younger age to watch all of these movies, but superhero movies can have intense scenes. You know your kids better than anyone and can best make the decision as to what movies are best for your family. The Incredibles (Ages 7+, rated PG) – I cannot think of a better superhero movie choice for younger kids than The Incredibles. This Pixar classic about a family of superheroes is funny and exciting. It truly can be enjoyed by both kids and parents. Big Hero 6 (Ages 7+, rated PG) – Big Hero 6 is another great animated superhero movie about a group of kids who turn into superheroes. It’s fun and has a great message. Just know that one of the main themes in this movie is dealing with grief, but in a kid-appropriate way. Superman the Movie (Ages 8+, rated PG) – Most live-action superhero movies are not the best for younger kids, but Superman the Movie – the classic starring Christopher Reeve – is a good safe choice for the family. It’s fun and action-packed, but not as intense as the more recent offerings. Spider Man (ages 11+, rated PG-13) – There are quite a few Spider Man movies, but in my opinion, the 2002 version starring Tobey Maguire is my favorite. It’s funny, action-packed, and tells the origin story of this popular superhero. Captain America: The First Avenger (ages 11+, rated PG-13) – Captain America: The First Avenger is probably the most tame of all the Captain America movies. It’s also a whole lot of fun! Since this is the first Captain America movie, it tells the origin story and it’s always fun to learn how a favorite superhero came about. Wonder Woman (ages 12+, rated PG-13) – If you want to see a movie with strong female characters, pull up a couch and slip this DVD in the player. This is yet another origin story (origin stories are the best!) with a fun, sensitive, and strong character. Ant-Man (ages 12+, rated PG-13) – Ant-Man is tamer than many of the other superhero movies and also full of humor. But, there’s still a lot of comic book fun. It’s a fun story of an unlikely hero. Thor: Ragnarok (ages 12+, rated PG-13) – Unlike the other movie picks, Thor: Ragnarok is not the first movie in the Thor series. But, it is the funniest and has the better story. You don’t even need to have watched the first Thor movie to enjoy this one (and I know because I still haven’t watched the first one). Guardians of the Galaxy (ages 12+, rated PG-13) – Guardians of the Galaxy is probably the most fun of all the superhero movies. It’s full of humor, an awesome group of rag-tag characters, and by far the best soundtrack out of any of these movies. It’s definitely a favorite in our family. Black Panther (ages 12+, rated PG-13) – It was hard to decide, but Black Panther is probably my favorite out of the entire list. It features diverse characters, strong and smart female characters, an amazing fictional city, and a story that hooks you from the very beginning. It’s lots of fun with a great message. Bonus: The Avengers (ages 13+) – I’m including The Avengers as a bonus movie on the list because it’s definitely one of the best – though it’s more suited for tweens, teens, and above. It’s more intense at times but the story is great and it definitely ties a lot of the other movies together. 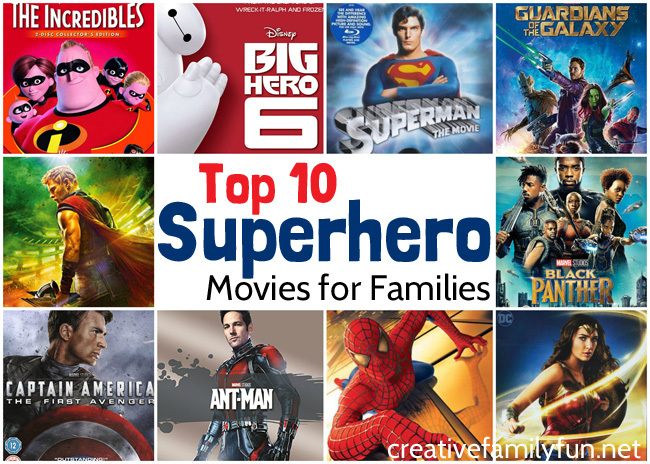 If you’ve got superhero fans in the family, you’ll definitely want to try one of these superhero movies for families at your next family movie night. They’re exciting and so much fun! Family fun can happen anywhere. You can find adventure at home, in your community, and even when you travel. We’re going to be highlighting some ideas for family adventure all over the globe, starting with family fun in Edinburgh, Scotland. MaryAnne from the awesome blog Mama Smiles – Joyful Parenting recently spent some time there with her family and she’s here sharing some fun ideas with us. Let’s travel to Edinburgh, Scotland! This summer, my husband and I took our four kids to Scotland for the summer. For four weeks! It was our second time making the trip (DH takes students over to study), and I wasn’t sure how it would go. The kids had loved Edinburgh at 3, 6, 8, and 10 years old. What would they think of the city at 5, 8, 10, and 12 years old? We’d already spend four weeks there; would they want to revisit the same sites again? Would they be open to exploring new places? I needn’t have worried. Edinburgh is an incredible place for families to travel. Our four weeks in 2016 flew by, and the same was even more true of our four weeks in 2018. As the capital of Scotland, Edinburgh is full of exciting things to do. 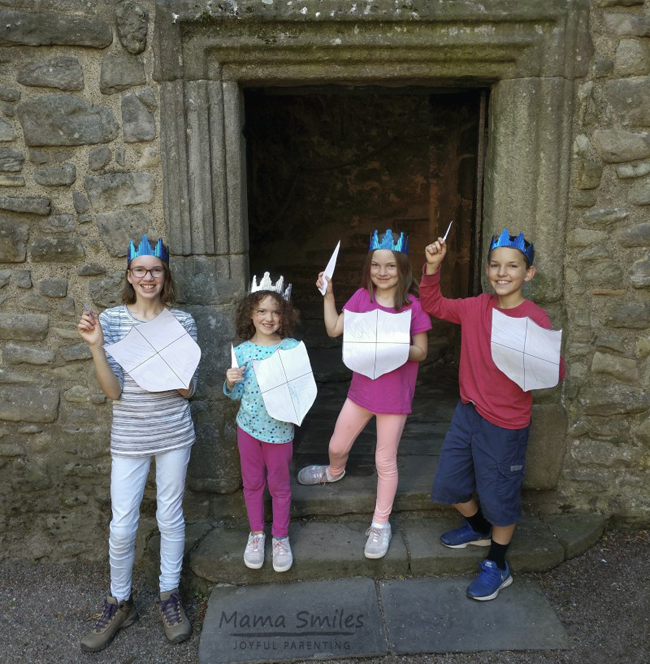 From the free museums my children adore to two castles (the well-known Edinburgh Castle and lesser-known but not-to-be-missed Craigmillar Castle) and a palace, the city is bustling with exciting things to do. You can even tour the Scottish Parliament! 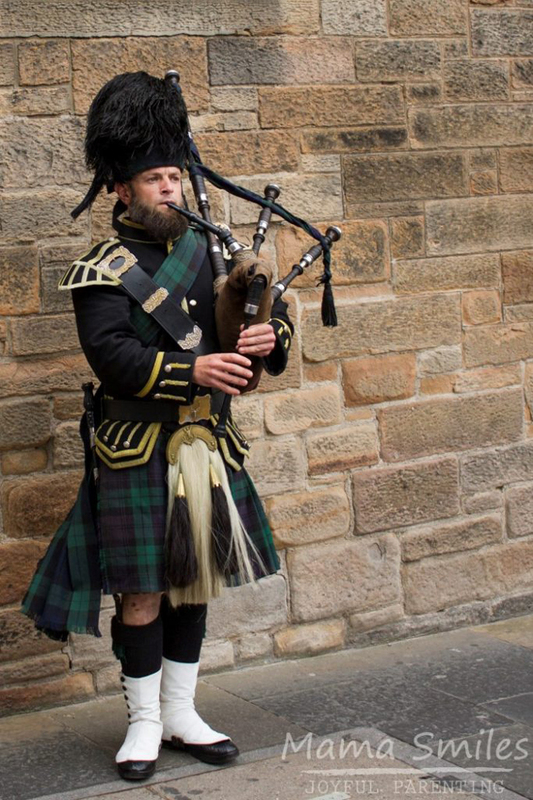 There is usually a bagpiper playing along the Royal Mile, along with other street performers. This summer the kids also enjoyed a sand artist who was there every time we visited. We always stay near the Meadows, a free public park with lovely expanses of green grass and two fun playgrounds the kids love. Hike to the top of the nearby Arthur’s Seat for stunning views of the entire city. 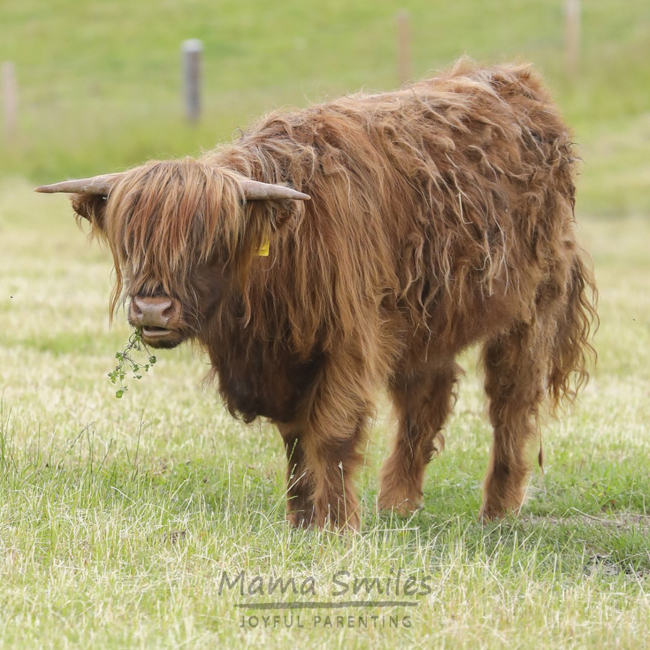 Travel to the edges of the city for sandy Portobello beach and sightings of Highland Coos. The city is surprisingly compact; you can walk to many sites (a large number are found along the Royal Mile). We always take Edinburgh public transport – even to out of the way sites. My kids enjoy seeing how many people they can wave to and convince to wave back when we ride the buses. Edinburgh is one of those cities where you can experience all four seasons in a single day. You’ll definitely want to pack layers, including some that can handle being out in the rain. This summer it only rained twice, which is highly unusual. Two years ago we had only one day when it didn’t rain! We brought a collapsible backpack along this year, which proved really useful for carrying extra layers when the sun suddenly decided to show up. The buses are not air conditioned, which can be uncomfortable on those rare occasions (like this past summer) when the weather is warm. 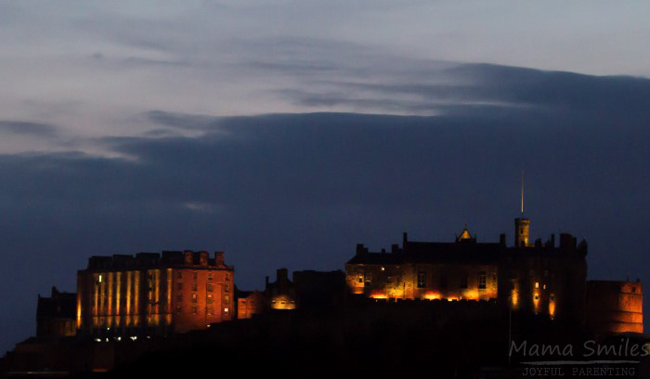 If you have the time, don’t be afraid to venture to cities outside of Edinburgh! Trains to Glasgow run frequently, and there are affordable buses to cities throughout Scotland. We took the train down to London this past summer, and the kids enjoyed the five-hour journey. Thanks MaryAnne for all these fabulous tips for family fun in Edinburgh! MaryAnne lives in California with her husband Mike and their four kids: Emma, Johnny, Lily, and Anna. 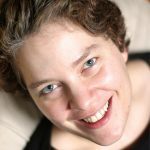 She blogs about parenting, education, crafts, and family travel at https://www.mamasmiles.com/. Follow her family’s daily adventures on Instagram. 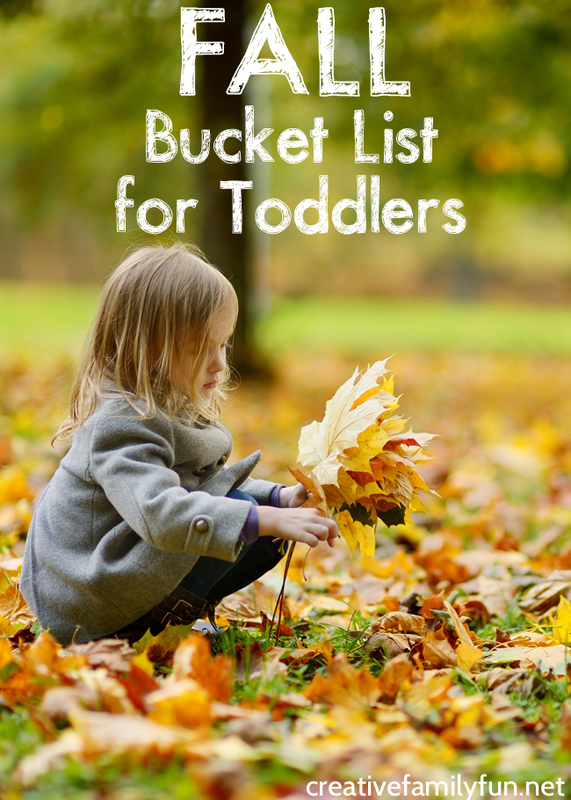 Find book recommendations at Great Family Reads, and toy recommendations at Top Toy Finds. 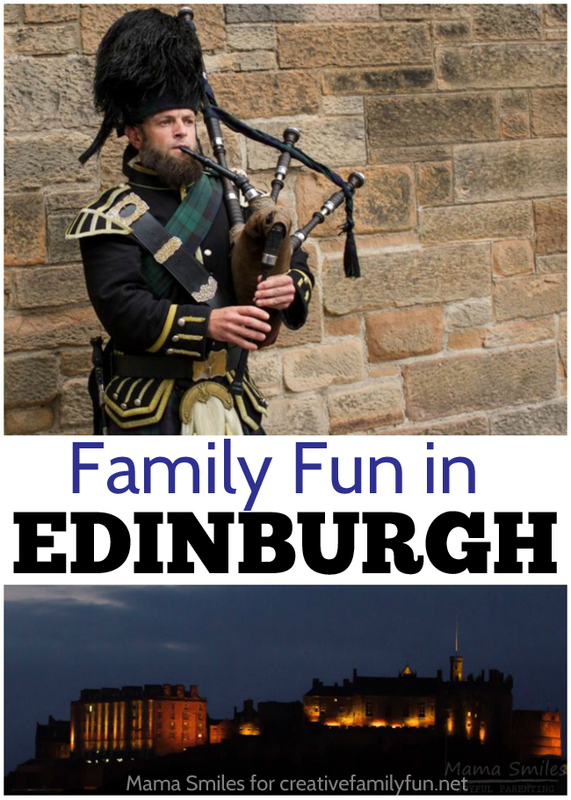 If you enjoyed these ideas for family fun in Edinburgh, the above photo is perfect for saving on Pinterest. Ahhh July. 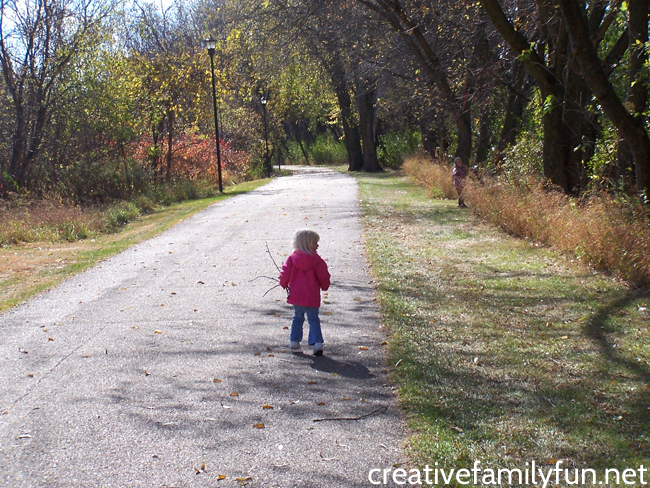 Summer is here, the kids are out of school, and it’s time for a few simple family adventures. But, what to do? There’s always swimming, camping, or visiting a playground. Those ideas are always fun, but it’s probably something you’ve already got on the schedule. If you’re looking for something new, here are 10 ideas for some July simple family fun. These fun and frugal ideas will get you out of the house for a fun adventure and some will help you find adventure indoors. 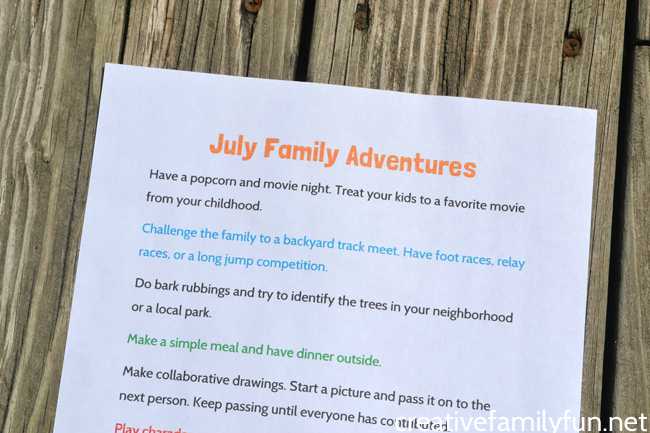 Print out your July Family Adventures, pick out a couple of fun things, jot them on the calendar, and have some fun! Challenge the family to a backyard track meet. Have foot races, relay races, or a long jump competition. 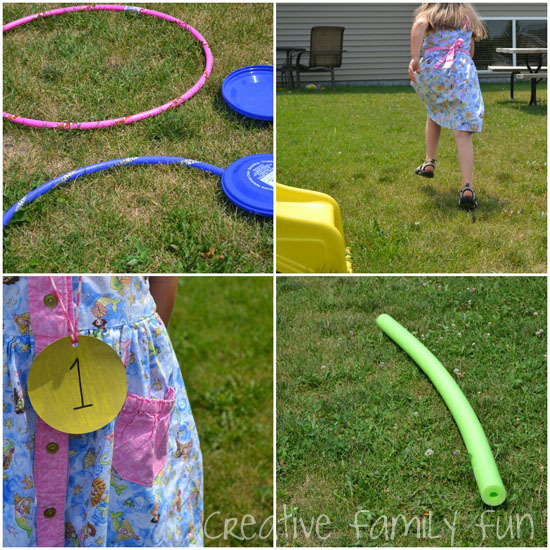 Or, you can go bigger with a fun Family Olympics! Do bark rubbing and try to identify the trees in your neighborhood or a local park. If you don’t have a tree field guide, you can borrow one from your local library. Make a simple meal and have a picnic dinner outside. Go on a pattern hunt. See how many patterns you can find outside. You can even bring this challenge inside to find patterns around the house or even your favorite store. Have a popcorn annd movie night. Treat your kids to a favorite movie from your childhood. Do you need suggestions? Here are our favorite musicals for family movie night. Make collaborative drawings. Start a picture and pass it on to the next person. Keep passing until everyone has contributed. Play charades or another old-fashioned game. It you want to take it outside, you could play Red Light, Green Light or Mother May I. Start a gratitude journal. Have each family member record things that make them grateful every day or once a week. 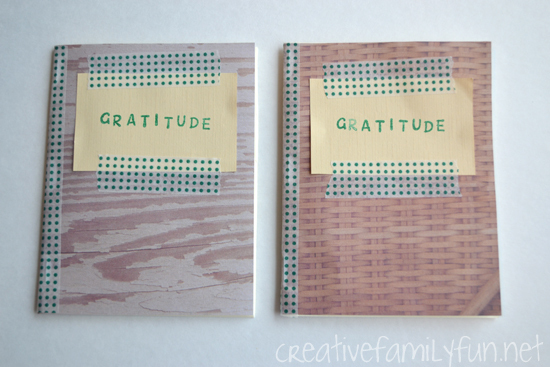 You could buy a pretty journal or use our tutorial to create your own simple gratitude journal. 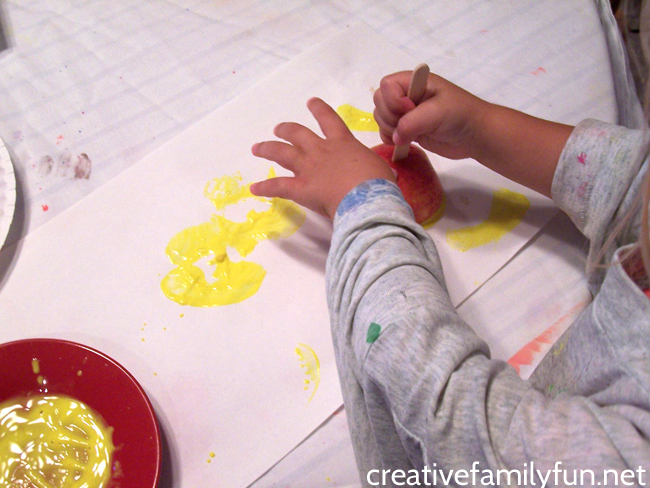 Finger Paint! As adults, we usually stand back and let the kids have all the fun. But, for this challenge, dig in and get your hands dirty too. It’s so much fun! Have a joke-off. Learn a few new jokes and make each other laugh. 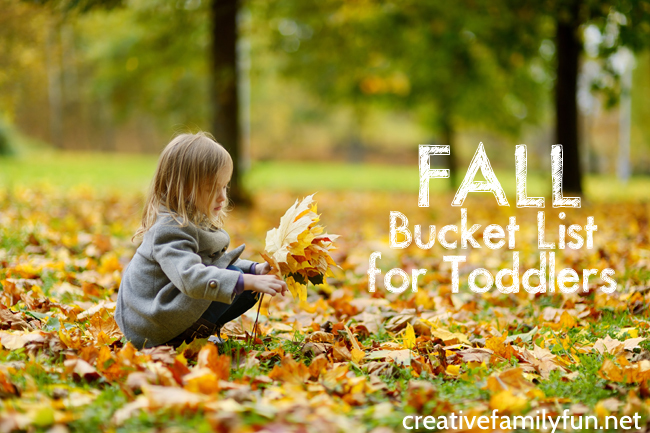 You can find new jokes from a fun book or this great post from Frugal Fun for Boys & Girls. You can grab a copy of your July Family Fun Ideas here. Just download and print. It all prints on one sheet of paper. Hang it up and use it to inspire the family all month long. Choose a few ideas now and save a few for later. 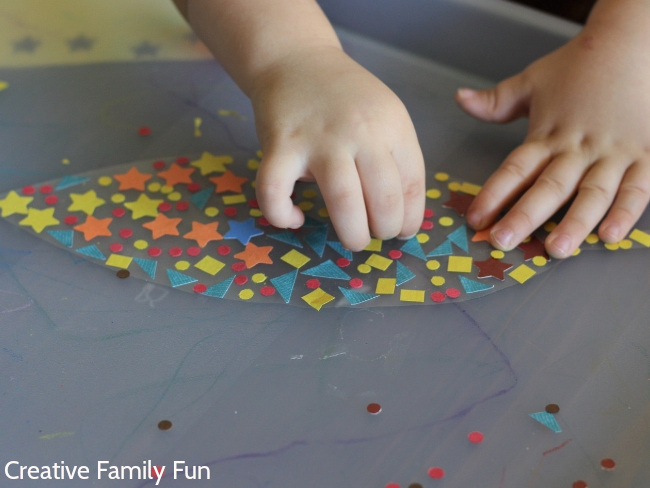 Even though these are July Family Fun ideas, you can do these anytime of the year. 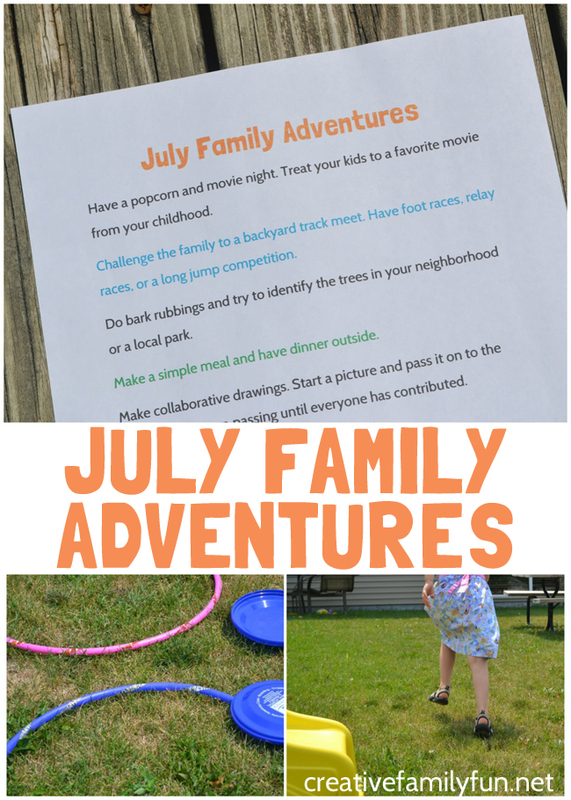 Get your printable July Family Adventures here. Which of these July simple family fun ideas are your going to try?